This recipe seems pretty intimidating. Honestly though it is made with a handful of inexpensive fresh ingredients along with pantry stapes you probably already have. 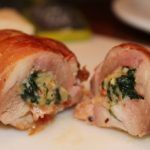 Even the process of assembling these Prosciutto Wrapped Spinach Ricotta Stuffed Chicken Thighs is fairly easy. Don’t let the title fool you. All you do is roll up pounded out chicken thighs around a cheesy spinach filling. Then wrap the mess in prosciutto or bacon. Rolled dishes, both sweet and savory, are actually called a roulade which originates from the French word ‘rouler, meaning ‘to roll’. It is a great way to essentially get your main dish and a side dish all in one! Wrapping these stuffed chicken thighs in prosciutto not only gives them great flavor. It also helps keep the filling intact while you bake them. Just be sure to secure them with toothpicks. If you want to cut down on dishes when you make this recipe use an oven safe skillet to cook the spinach. Just wipe out the skillet first. 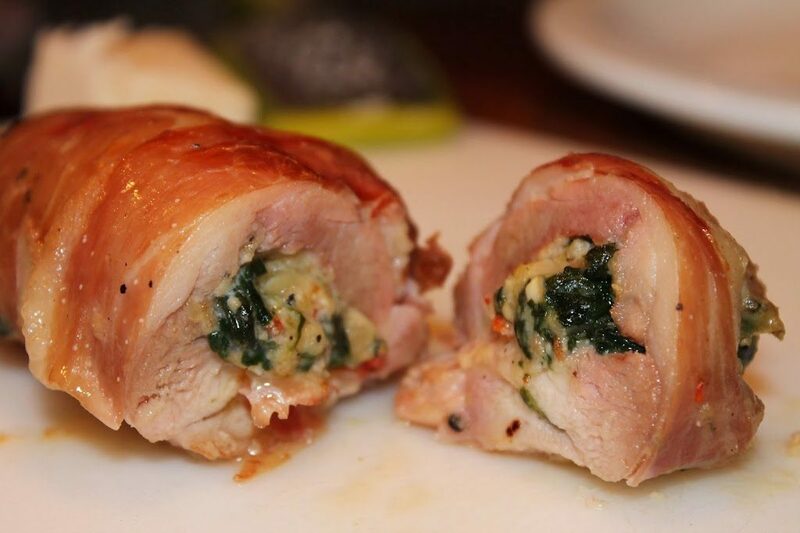 Then reuse it when you bake these Prosciutto Wrapped Spinach Ricotta Stuffed Chicken Thighs. A cast iron skill would be excellent in creating a nice crispy exterior! You could sear them on the stove. Then finish the dish in the oven. I hope you like our Prosciutto Wrapped Spinach Ricotta Stuffed Chicken Thighs as much as my crew does. If you love this elegant date night recipe, you can find more like it by checking out my Main Dish section! For recipe inspiration delivered to your inbox, subscribe to my newsletter, follow my photography journey on Instagram, and for generally inappropriate humor follow like me on Facebook! 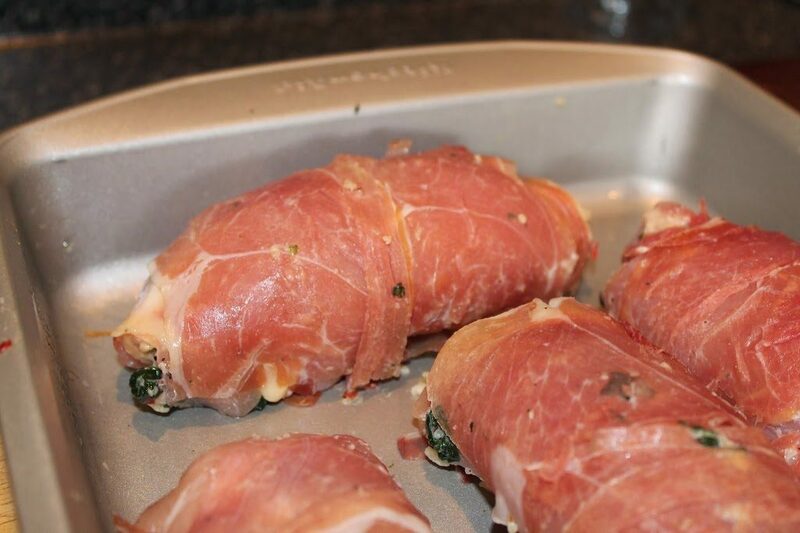 Tender chicken thighs with a cheesy spinach filling wrapped in salty prosciutto baked to crispy perfection. Pat chicken thighs dry with paper towel. Lightly season with salt and pepper on both sides. Set aside on a baking tray. Heat oil in a large skillet over medium heat. Add shallot and red pepper, cook 3-4 minutes. Stir in garlic, cook 1 minute. Mix in spinach, cook for 3-4 minutes until wilted stirring occasionally. Let cool. In medium bowl mix together cheeses, breadcrumbs, and egg. Stir in spinach mixture to combine completely. Evenly spoon spinach filling onto the inside of each chicken thigh. Roll chicken around filling, wrap with slices of prosciutto. Secure chicken with toothpicks then place face down in greased 8x8-inch baking dish. Cover with foil, bake 20 minutes. Uncover and bake another 10 minutes until the prosciutto is browned. Let rest 5 minutes before serving. 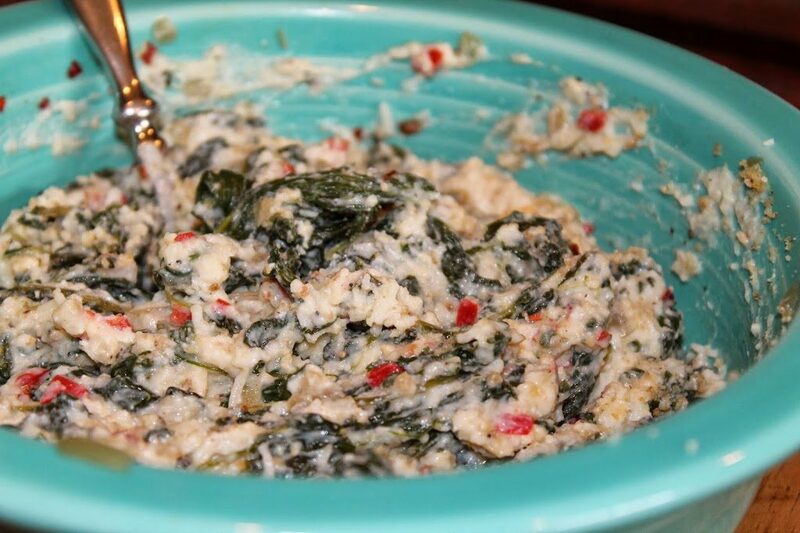 Tip- Double the spinach filling and freeze for use in recipes like stuffed shells, manicotti, or lasagna. There are no words to express how delicious this looks. Great job.